Our Jack the Ripper school tours are specifically designed to balance incredible story-telling and in-depth analysis, creating an educational experience that keeps students engaged and interested throughout. By tailoring our service to the modern curriculum, our school tours are perfect for A-Level or GCSE students, helping pupils learn about the Victorian era, 19th-Century police investigation techniques and turn-of-the-century policing in comparison to modern day operations. Discover more about our Jack the Ripper school tours below and explore how you and your students can benefit from our unique Jack the Ripper experience. Why Our Jack the Ripper School Tour? As one of the most respected Jack the Ripper tours in London, we continually strive to offer the best school tours in the city. 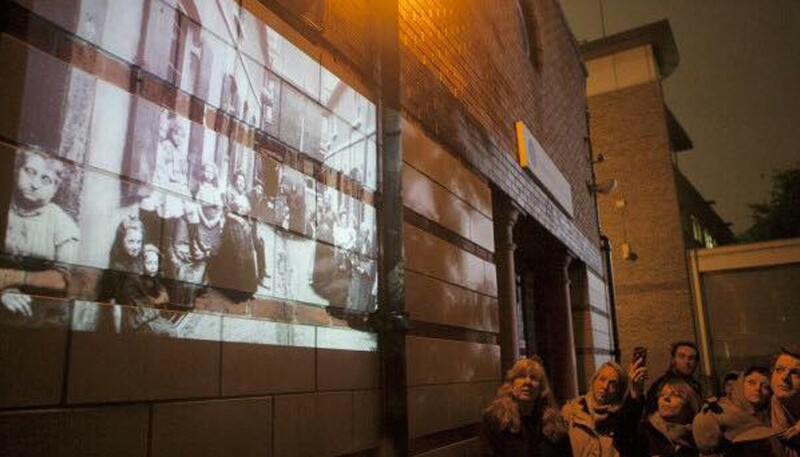 The tour’s content is exclusive and unique, utilising our Ripper-Vision hand-held projector system to showcase the original police sketches and photos from the era, all whilst exploring the locations where the incidences occurred. Ripper-Vision alone has been regularly praised by previous students, keeping them engaged and interested throughout the experience, yet it’s not all that we have to offer. Using police reports, eyewitness testimonies and psychological profiling taken straight from the FBI criminal investigations, we can, at last, present the definitive story of the Autumn of Terror. This allows us to shed light not only on who the killer may have been, but also where he most likely lived, too - information that makes our tour surpass the competition. By combining imagery from the period with captivating tour guides and real police reports, we have created an informative Jack the Ripper school tour that holds the attention of students, provoking thought and analysis. Our team consists of real historians, authors and experts on the case of Jack the Ripper and the Whitechapel Murders, most of whom have been involved in organising the official Jack the Ripper conference every year since 1996. With some of the leading experts from across the globe, our Jack the Ripper school tours are guaranteed to deliver up-to-date, expert information, perfect for students studying the time period or the truth behind the legend. In addition to our tour guides' conference experience and expert status, our team have also advised for many historical documentaries, books, TV shows and films, including the famous Ripper Street and London Calling. We have appeared on Sky News, CBS, The History Channel, Secrets of Scotland Yard and much more. Who better to teach your students about the ways of the Victorian era and the case of Jack the Ripper than the crime experts themselves? Our Ripper-Vision tour was the first and only tour of its kind to bring the Jack the Ripper case into the 21st century. We have swept away the fiction in order to deliver the cold hard facts of the investigation - without shying away from the gruesome details. This makes our Jack the Ripper school tour one of the most educational on offer throughout London, clarifying the difference between truth and speculation. With over 25 years' experience, state of the art crime scene visual aids and connections throughout the Ripperologist network, we consider ourselves experts on Britain’s most notorious serial killer. With this in mind, we have compiled a full Jack the Ripper casebook featuring a range of school resources and in-depth information on every aspect of the Jack the Ripper investigation, from the victims through to the suspects themselves. For GCSE students, we recommend utilising the casebook to learn about London in 1888. The Whitechapel Murders happened at the peak of the Victorian era and London was experiencing rapid changes, the repercussions of which we are still feeling today. Alternatively, if Jack the Ripper is being studied directly, then exploring the faces behind the police investigation is guaranteed to offer newfound knowledge on the subject without delving into the gruesome details. This information is perfect for supporting lessons, assisting in homework completion as well as for revision and we further explore the topic on our Jack the Ripper school tours. Depending on the A-Level subjects being studied, our casebook has a range of different resources and vast amounts of information that will help. For criminology or psychology students, our criminal profiling section reveals the science and strategies behind the multiple Jack the Ripper profiles constructed over the past 130 years. English students may prefer to look into the Jack the Ripper letters to investigate Victorian language, whilst history students can make use of the extensive detail we go into regarding the Jack the Ripper suspects and victims. Whatever the subject, if you are looking into Jack the Ripper and the Victorian era, our casebook has something to offer. Resource: The Whitechapel Murders, the police investigation and the suspects. Resource: The police investigation, the suspects and London in 1888. Question: “Of the Whitechapel Murder victims, which were most likely to have been killed by Jack the Ripper and why? Resource: The police investigation and the victims. Of course, these questions are just the tip of the iceberg; be sure to explore the casebook for yourself to inspire further ideas. All coursework is significantly benefitted by attending a Jack the Ripper school tour, simply because it offers students and teachers the opportunity to ask an expert in person whilst exploring the locations and settings firsthand. Book a Jack the Ripper school tour today and develop your students' knowledge of Britain’s most infamous serial killer.